Buildings 16 and 17 are two of the biggest at Microsoft headquarters – sturdy, brick-and-glass tributes to the practical 1980s, when the company was focused more on manifesting Bill Gates’ vision to put a computer on every desk and in every home than on the architectural prowess of its campus. Inside, however, is a different story. There is light, air and art. There are new, retooled work spaces and vibrant common areas. Once fortresses of winding corridors, fluorescent lighting and private offices, the buildings were recently gutted and radically redesigned not just to be more interesting and modern, but to offer employees an unprecedented range of ways to get things done. In the parlance of the zip code, Buildings 16 and 17 have been totally hacked. After all, it would be a non-starter for Microsoft to have the goal of empowering everyone on the planet to achieve more without trying to do the same for its own employees. The buildings sport all the familiar hallmarks of a modern tech company – the plethora of free beverages, the ping pong and pool tables, the gourmet café, the standing desks. But from there, the offerings get more unusual. For starters, Building 16 and 17 are office-free. Designed with the idea that there is no one best way to get work done, there are an unparalleled range of working environments. Employees and even executives work together in large, shared rooms called “neighborhoods.” They roam high-ceilinged hallways and stop for impromptu meetings in angular atriums designed to capture and perpetuate light. They head into large, glass team rooms to collaborate, or into one of the many focus rooms or cozy alcoves for privacy. They yell and whoop in an Xbox game room, and take their shoes off to quietly recharge in the company’s first-ever No Tech Lounge. “It’s a new look for the new Microsoft,” said Jochen Liesche, a business manager for the Data Platform group who helped with the redesign. “I think ultimately the physical space really represents the culture here. It’s almost as if the physical space is a proxy for the company’s mission and its culture,” he said, cheerfully adding that the inspired employee works much harder than the uninspired employee. He abruptly stopped talking when, as if on cue, a smiling woman glided by on a Razor scooter and disappeared around a corner at the end of a long, polished concrete hallway. It’s a new look for the new Microsoft. Buildings 16 and 17 house the Cloud and Enterprise teams, people who spend each day designing, building and maintaining the Microsoft Cloud. Liesche said the space was designed to make sure employees stay happy, comfortable and inspired to do their best work. Travis Lowdermilk is all of the above. The remodel of Buildings 16 and 17 aims to reflect the beauty of the Pacific Northwest, including the peaks and canyons of its Cascades mountain range. This great indoors is “biophilic,” a kind of design that incorporates natural materials, elements and colors meant to mimic nature. The walls and ceilings are angled. There’s not one shade of green or blue, there are 20. The walls feature topographical maps. In the light-filled atrium of each building there are slanted and angular walls designed to look like the canyons and peaks of the Cascades. A digital art installation called “The Cube” hovers in the lobby of Building 16, emitting a warm techno-hum. The Cube changes hues like a mood ring throughout the day, from green to pink to blue. “When it gets to be dark purple, you know it’s time to go home,” one building resident joked. A staircase to the second floor takes employees and visitors through the center of The Cube. Inside, a Kinect sensor detects people walking up and down the stairs, and the scene inside The Cube changes in response – if one person ascends, a few birds fly around; if a bigger group descends, a large flock of projected birds swirls around them. The Cube was conceived inside The Hive, an 11,000-square foot lab several miles away, where the Microsoft Real Estate and Facilities team experiments with new building designs. For decades, Buildings 16 and 17 consisted largely of private offices, but with the remodel, the walls literally came tumbling down. Now, everyone works in a neighborhood. Essentially, it’s like the student housing at the fictional Hogwarts – each team works from its own large, open common room, one they were invited to customize to their liking. Each team also has dedicated focus and meeting rooms. In the months since the move, the neighborhood format has gained support. Headphones or one of the building’s many secluded coves are the new closed door. Email traffic is down; people have quick “pop-up conversations” instead. No one fights over meeting rooms any more. Some neighborhoods look exactly the same as when employees moved back into the remodeled buildings earlier this year. Others, like the Data Platform Designers neighborhood, are totally tricked out. The team took full advantage of the stipend Microsoft offered for neighborhood customization. They bought Nerf blasters, plants, a disco ball and color-shifting rope lights above the ceiling tiles to give the room an ethereal glow. As you enter the room, a ukulele is poised artfully on a chair. Next to shelves full of toys, books and board games, stereo speakers stream gently thumping music. Practically every surface in their neighborhood can accommodate doodling, whether markers or chalk, and they even had a team-building event to spray paint plywood to make graffiti-covered modular shelving. That’s what makes the building design complete, when users start customizing and putting their own personality on the space. It’s the most important part. “I hardly send emails anymore, maybe just five or six a day. I just get up and talk to people now,” said Michael McCormack, manager of the Data Platform Design team and ringleader of his team’s wickedly cool design. His team creates user interfaces to make sure people (“not developer people, regular people”) can easily use data platform software. A member of McCormack’s team walked by and, overhearing the topic, joined the discussion (the kind of thing that happens dozens of times a day, now that people aren’t holed up in private offices). McCormack has now been at Microsoft for 15 years. He and his team worked hard on the design of their new space because as designers, they need inspiration wherever they can get it. “We need to look for ideas to move us forward, whether those come from watching videos, listening to music, or drawing on stuff.” Or from team pranks, like the time they replaced the buttons on all the ice machines in the building with tiny pictures of rappers Ice Cube and Ice-T.
“We try to be a little unexpected,” he said with a sly smile. The massive windows in the Data Platform Design neighborhood look out onto an expansive courtyard checkered with bricks and metal tiles. From far away it looks like some sort of human-scale chessboard, but up close, it’s a time machine. Each metal plaque is inscribed with the name and date of products past, a staggering collection of hits (Microsoft Word), culture (Microsoft Wine Guide), curiosities (Microsoft Dangerous Creatures) and a little bit of why-did-this-ever-stop-happening (Microsoft Dinosaurs). Back inside, a shoeless employee rests in the No Tech Lounge. What business does one of the world’s largest tech companies have building a designated tech-free area? Plenty. “If you work and work and work on stuff without being able to have quiet moments, you’ll get to a point where you just explode,” said Covarrubias, who led the redesign. “There’s a purpose behind it, it’s not just, ‘Let’s throw in some fun places.’ Playing, resting – they’re very different, but both are helping your mind so you can come back fresh. The Xbox Lounge – a spacious room with stadium seating, cabinets full of video games, and two large, flat-screen televisions – is hardly ever empty, and rarely quiet. Like the nearby No Tech Lounge, it’s a place for employees to disconnect — or rather, to disconnect by connecting with The Master Chief or Real Madrid to blow off some steam. “There’s the work itself, and there’s also the long hours and the need to get away from the work. The brain needs to rest so when you come back, you’re smarter. These spaces provide employees with a place to reconnect with themselves and chill during the week so they don’t have to wait for the weekend to disconnect completely,” said Covarrubias. Take a few steps off the trail while hiking through the Cascades and you can find a secluded place for reflection or just a nice spot to eat some trail mix. It’s much the same in Buildings 16 and 17, where employees can find private alcoves just off the beaten path. Behind a wall made of thick, hanging ropes made to look like vines is a comfortable hangout with high-backed loungers and a hanging basket chair, a place to plug in your phone or laptop, and a place to set your drink. It’s a sweet hideout from which to make a phone call, read or gaze out the window in an unfocused fashion as a brilliant idea materializes in your brain. BYO trail mix. In the second floor atrium of Building 16 is one of the crown jewels of the remodel, a pair of fancy espresso machines flanked by a refrigerator full of milk. During peak caffeine hours (the morning rush, the afternoon crash), dozens of employees form two long lines, chatting as they wait to make themselves a latte or cappuccino. The buildings’ inhabitants include employees who are there on call for 24 hours at a time providing technical support for Microsoft’s cloud customers. In the Building 16 Café, I find Executive Chef Elijah Coe supervising a busy mid-week lunch, including a daily special of his own creation: King salmon with preserved lemon souboise, root vegetable hash and fig béarnaise. Café 16 serves several surrounding buildings and features a wide variety of options. There is sushi, pizza, a salad bar, a French bakery that makes nearly everything from scratch, and a number of unique daily dishes. Here, there will be no vats of macaroni and cheese served with an ice scream scoop. The café uses ingredients that are largely local, organic and seasonal, and serves fare that is frequently experimental. Coe teaches weekly afternoon cooking classes where employees can learn to make everything from clam chowder to French macarons. Coe was formerly a chef in the Royal Navy, where for a time he cooked for the Queen of England and her family aboard The Royal Yacht Britannia. Coe arrived ready to dazzle the family with his cooking skills and was surprised to find the menus focused on simple, healthy food that was local to wherever they were docked. Coe has cooked for high-profile restaurants and catering clients such as the Lincoln Center for the Performing Arts, the Guggenheim Museum, the Academy Awards and the Grammy Awards. Down the hall, I find Travis Lowdermilk, the user experience designer for Visual Studio, sitting in Building 16’s user research lab and recording studio. He and his brother Ryan Lowdermilk co-host a podcast, the Windows Developer Show, which is currently on hiatus but has attracted up to 40,000 listeners a month. Five years ago Travis and Ryan were Microsoft “fan boys” who loved the (then-new) Windows Phone 7 so much they decided to launch a podcast to talk about developing apps for it. Back then, Travis recorded from the quiet of a hall closet at his house, and Ryan from a minivan in his garage. The podcast gained popularity and both brothers landed jobs at Microsoft. Eventually their rustic podcasting setup transitioned into top-of-the-line equipment, which now lives in Building 16’s soundproof booth. Employees from all over the company use it to record podcasts on a wide range of topics and to record professional-grade audio for videos, demos or presentations. “We’re more than happy to see the equipment get used at Microsoft more broadly,” Lowdermilk said. 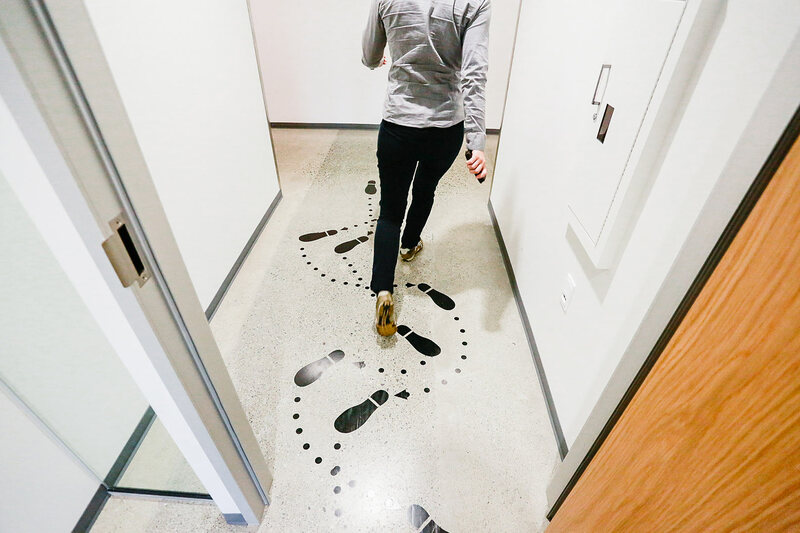 Outside the studio door is a world-class user research lab where software makers can test how people use their products. There’s even a “Skypebot,” a sort of robot with a screen at face height for more realistic video conversations and meetings. Remodeling the buildings, much like designing software, means finding a balance between preserving the legacy while also adapting and evolving for the changing way in which people work, Clarkson said. “You can’t start from scratch every time. I think there’s a good larger message in that,” she said. The remodel of Buildings 16 and 17 at Microsoft headquarters takes inspiration from the natural beauty of the Pacific Northwest, including the peaks and canyons of the Cascades mountain range. Inside The Cube in the Building 16 lobby, a Kinect-enabled screen changes in real time as people pass by. If one person ascends, a few birds fly around; if a bigger group descends, a large flock of projected birds swirls around them. With the remodel, the walls literally came tumbling down, and now each team works from its own large, open common room. As part of the remodel, employees customized their new team spaces. Some installed shelving, while others added more creative touches, like these instructional breakdancing decals. Outside the buildings is an expansive courtyard checkered with bricks and metal tiles, a time machine of sorts – each metal plaque is inscribed with the name and date of a wide variety of products past, from Microsoft Word to Microsoft Wine Guide. The Building 16 No Tech Lounge, the first of its kind at Microsoft headquarters, is a place for employees to disconnect and recharge. 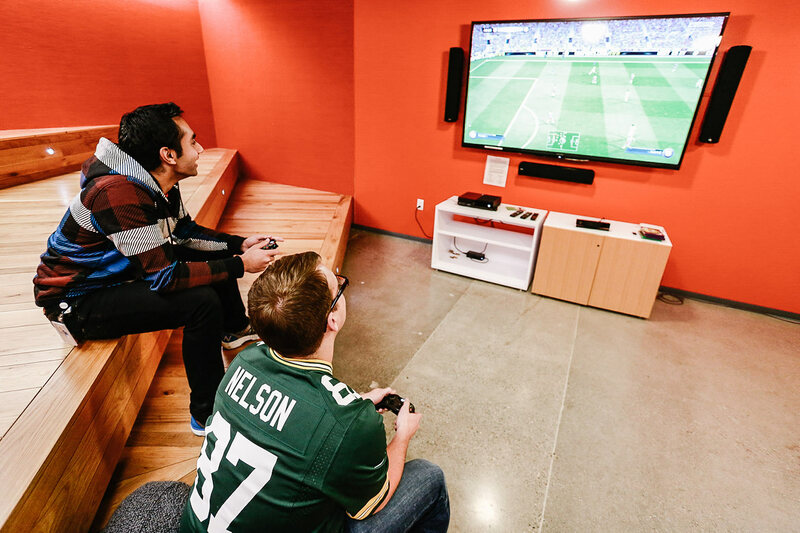 The Xbox Lounge – a spacious room with stadium seating, cabinets full of video games, and two large, flat-screen televisions – is where employees go to blow off some steam with The Master Chief or Real Madrid. The buildings are full of private, out-of-the-way alcoves – sweet hideouts from which to make a phone call, read, or gaze out the window in an unfocused fashion as a brilliant idea materializes in your brain. In the second floor atrium of Building 16 is one of the crown jewels of the remodel, a pair of fancy espresso machines flanked by a refrigerator full of milk. During peak caffeine hours (the morning rush, the afternoon crash), dozens of employees form two long lines, chatting as they wait to make themselves a latte or cappuccino. We don’t want it to be the typical work cafeteria where people come only because they have no choice,” said Daisy Mendes, General Manager of Café 16. “We want to make it so good people can’t wait to come back." 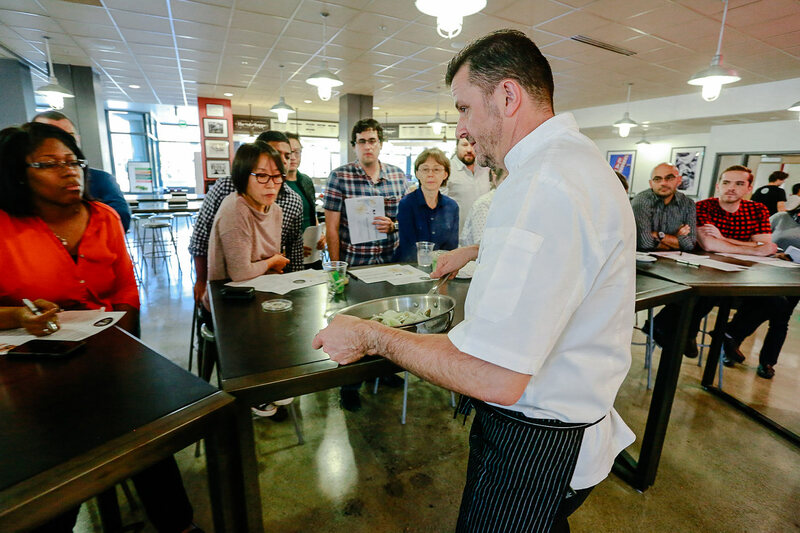 Café 16 Executive Chef Elijah Coe teaches employees to make British-style clam chowder. 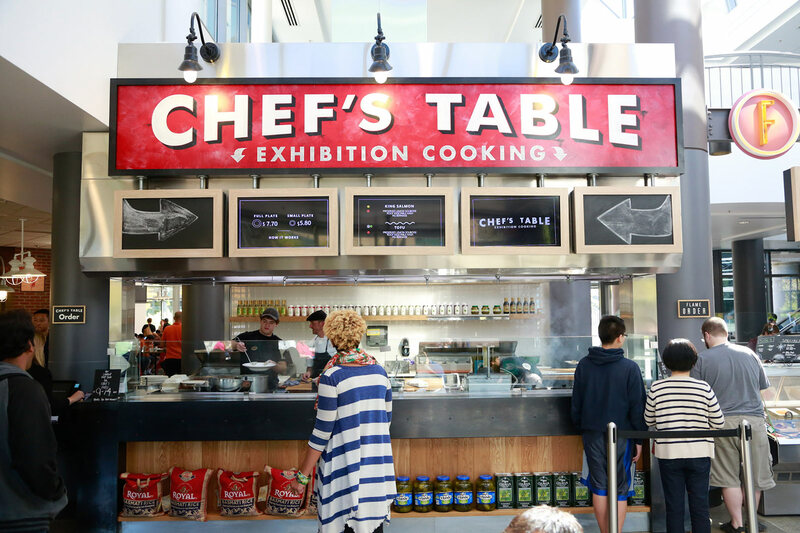 Coe teaches frequent afternoon cooking classes for Microsoft employees. Travis Lowdermilk, co-host of the Windows Developer Show podcast and a user experience designer for Visual Studio, records in Building 16’s top-of-the-line recording studio.